Bengaluru: Chief Minister H.D. Kumaraswamy announced waiver of all default crop loans benefiting farmers to the tune of Rs.34,000 crore in his Budget proposals presented in the Assembly this morning. The size of the Budget is Rs. 2,13,734 crore and to balance the financial burden of the farm loan waiver, tariffs and taxes on petrol, diesel, electricity, liquor and private service vehicles have been increased. The CM has proposed to increase the rate of tax on petrol from the present 30% to 32% and diesel from 19% to 21%. In effect, petrol price will be increased by Rs. 1.14 per litre and diesel by Rs. 1.12 per litre. Tax on liquor will go up by 4 percent and power tariff will be up by 20 paise per unit. There will be a 50% increase for private service vehicles based on square metre floor area the vehicle occupies. Kumaraswamy said crop loans made up to December 31, 2017 would be waived off in the first stage. He said the loan amount would be restricted to Rs. 2 lakh. However, families of government officials and officials of the co-operative sector, farmers who have paid income tax for the past three years are ineligible for the farm loan waiver. As an encouragement to non-defaulting farmers, the CM has decided to credit the repaid loan amount of Rs. 25,000 or whichever is less to each of the farmer’s account. 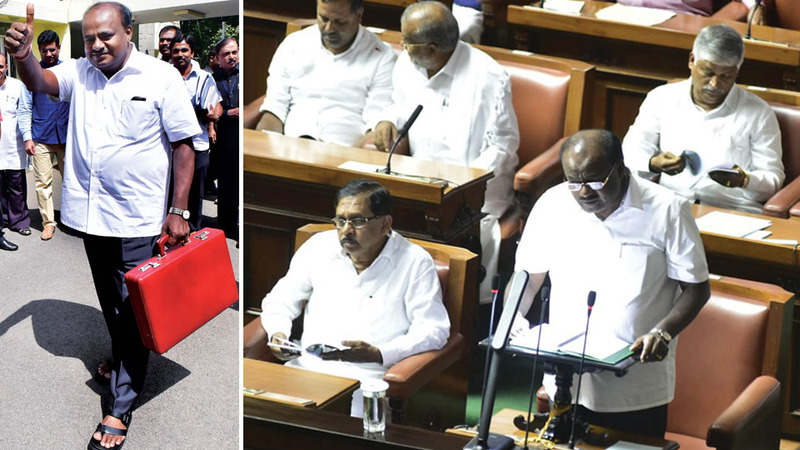 Kumaraswamy presented the Budget at 11.30 am today, the date and time decided by his brother H.D. Revanna, who is a firm believer in astrology. This is the first budget of the newly formed Janata Dal (Secular) – Congress coalition government. The Budget had been a topic of debate among the coalition members with former Chief Minister Siddharamaiah asking for a supplementary budget instead of a new one. Siddharamaiah had presented the budget in February this year. Mandya Institute of Medical Sciences Hospital to be upgraded to 800-bed hospital. Rs. 3 crore share capital to be provided to private companies who come forward to open 3-star hotels having 500 room facilities. 5 kg rice free of cost, 1/2 kg toor dal with subsidised rate and 1 kg palm oil, 1 kg iodine and iron content salt and 1kg sugar to each BPL card holder under Anna Bhagya. Fearing a backlash for backing out of his pre poll audacity of a commitment to waive farmers loans worth a whopping 53000 crore Rupees Karnataka Chief Minister H.D.Kumaraswamy has hit the common people hard by hiking up fuel prices.Obviously he has eaten more grass than he can chew and is being guided more by the survival instinct to somehow retain the political power he has usurped colluding with the equally power hungry Congress party.